Home/desk-mounted panels/One Desktop Privacy Panel or Two? One Desktop Privacy Panel or Two? 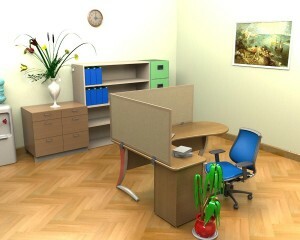 That’s a good question to ask if you are outfitting workstations at your office with our desk-mounted privacy panels. Some of our customers like to put up a panel across the front of the desk and add one along the side just like the setup in the photo. Here are a few questions that can help you decide whether you need maximum panel coverage. Each ‘yes’ answer means your employees are likely to be happier with two panels rather than just one. Are workstations located next to high traffic walkways? Is there a lot of noise in the workplace? Do employees have coworkers directly in front of them and on either side? Have workers expressed dissatisfaction with the privacy level afforded by their desks? Do employees work with paper or computer files that are considered confidential? Of course, since these panels can be easily mounted and removed, you don’t necessarily have to make up your mind without trying both options. It’s just nice to have an idea up front so you can order the right quantity and sizes. If you change your mind, you can always buy more later.